Yes, letting the children make the centerpiece is going to be much more work than simply buying a bouquet of flowers or some plastic wreath. But Christmas is the ideal time for establishing family traditions which build family ties. Think back to your own childhood. How many gifts and decorations can you recall? Probably not many. But what about family traditions? I bet you can name those quickly and that you have some very dear memories attached to them. Make a new family tradition -- let your children make the centerpiece and enjoy it all season long. 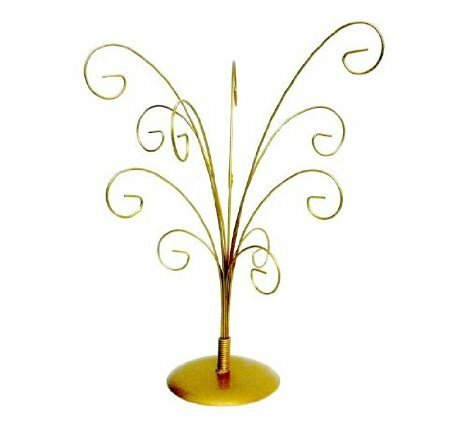 Whether you put it on the dining room table or on the coffee table makes no difference. The point is to be creative and make memories. If you have some evergreen in your yard, this centerpiece can keep the children out of the house for a few minutes while you work in the kitchen. Use an ordinary plate as your foundation. 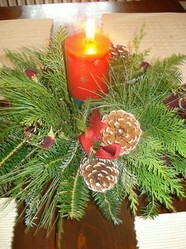 Then place a pillar candle on a base of florist's foam. Then stick sprigs of fresh evergreen into the foam until it is totally hidden from view. Tie a bow and nestle it down among the greenery. Optional decorations could be a pretty ornament, pinecones, smaller votive candles, or whole nuts scattered among the green sprigs. This centerpiece is so easy that it's almost too good to be true. All you need is a pretty glass bowl and a dozen or so traditional, round ornaments in various sizes. Although these round (and oval) ornaments were traditionally made of glass, using shatterproof ones is a safer alternative since food is being served near them. A broken ornament on the table could mean an entire dessert or casserole being thrown away. Have a hole punch and some string handy for making hangers for each ornament. Then assemble the ornaments onto the stand in a pleasing arrangement. You can also add bows to the centerpiece. 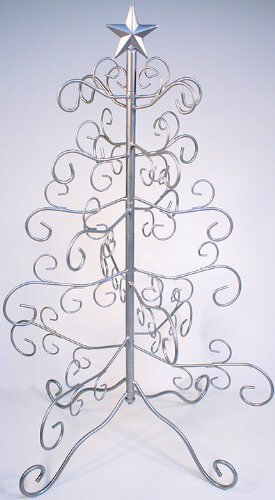 Simply cut lengths of ribbon and tie them directly onto the arms of the ornament stand. For extra glamor, place the ornament stand on a pretty plate or placemat. Or create a small fabric "tree skirt" for it with felt or gingham cloth. Let them dry for a couple of days before adorning your tabletop display with them. These look prettiest strung with simple red ribbon. Make an edible centerpiece that you won't have to store after Christmas is over. This centerpiece will take several hours to make. First you bake star shaped cookies in various sizes. The kit featured to the right has a set of ten graduated cookie cutters for this project. Let the cookies cool, and then stack them from large to small, using icing to cement them together. 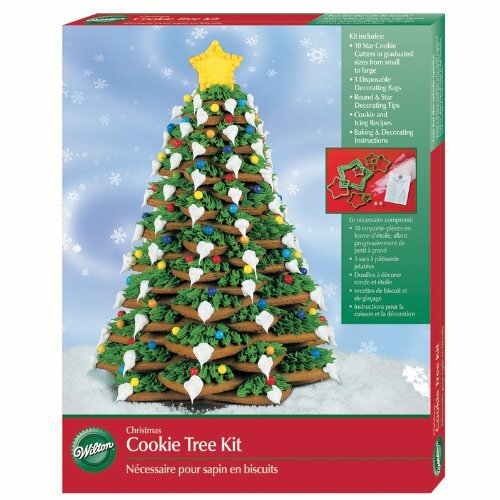 Then let the children decorate the cookie tree with more icing and candies. The original meaning of Christmas -- Christ Mass -- is to celebrate the birth of Jesus, the savior of the world. What better centerpiece than a nativity that tells the Bible story of Jesus' birth. Print out some templates and let the children color them in. Then have the children cut out the figures and affix them to cardboard bases or repurposed toilet paper tubes. Place the figures onto a tray and surround them with sprigs of greenery. Print this file onto paper, color, cut out and assemble for an easy nativity centerpiece. Save up those cardboard tubes inside of toilet paper for this cute craft. Free printables at Catholic Icing. These boxy templates are already colored. Just cut and assemble. I love these printable paperdolls. Affix them to cardboard stands or tubes to make a 3D display. Great ideas for kids. Some of my fondest Christmas memories from childhood are centered around these types of activities. Love the ideas and that all ages can join in. Great work! Love these centerpieces. They're beautiful but simple to make. What great ideas you've assembled here, Jimmie! I agree -- there's nothing like family traditions to share around the holidays. I hope lots of families take advantage of these Christmas projects. This page of ideas will certainly keep the youngsters occupied in what seems like an interminable time for them, between when school finishes and it is Christmas Day! Great ideas for all ages to add to the holiday decorations.